The content of this article provides interesting facts and information about Great Seal of the United States of America. The Great Seal of the United States of America is important as it represents and conveys the ideas, aspirations and beliefs of the country. The Great Seal of the United States instantly conveys interesting information and ideas about America. The images captured on the Great Seal of the United States summarize and encapsulate the history, values and ideals of the people of America. The Great Seal of the United States serves as a symbol of authenticity which verifies that government documents and papers of state are official and legal. The Great Seal of the United States seal is also an emblem that is representative of the country's origins, history, character and ideals. The spirit of America is reflected in the national motto of the United States of America. 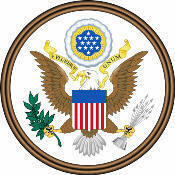 The Great Seal of the United States identifies government buildings and officials. The symbolism, history and emblems of the Great Seal of the United States are described in this article with fast, fun facts, pictures and information. The images and symbolism of the Great Seal of the United States of America conveys a sense of history and achievements to all those who look at it. Seals have a very long history and were even mentioned even in the Bible. Seals were first used because most persons, even wealthy people and the nobility, could not read or write. The highest ranking people showed their agreement and acceptance of an important document by making an impression of their coat of arms, usually with an engraved signet ring, into a blob of soft wax. This was the early version of a personal document being 'signed and sealed'. The uniqueness of an official seal meant it was difficult to forge or tamper with official documents. This eventually led to the idea that documents of state should also contain an imprint of a seal that bore witness to their authenticity. It therefore became important for every nation to have a Great Seal of state. A seal provided a pictorial expression of approval which everyone could understand this was in the mind of the men who designed the Great Seal of the United States. A 'Great Seal' is the principal seal of a government or state, with which official documents are stamped. Great Seal of the United States has two sides, the obverse (front) and the reverse side. When Congress adopted the Great Seal in 1782, "pendant seals" were in use. A wax disk was attached to the document by ribbons or cords. The disk had two sides, there was therefore the need for both a front or obverse side and a reverse side of the seal. Symbolically, the Great Seal of the United States reflects the beliefs and values that the Founding Fathers attached to the new nation and wished to pass on to their descendants. The obverse or front side of the Great Seal of the United States is used 2,000 to 3,000 times a year to authenticate the signature of the President on numerous official documents such as treaty ratifications, international agreements, appointments of Ambassadors and communications from the President to heads of foreign governments. The image on the obverse side of the Great Seal of the United States can also be shown on passports, coins, postage stamps, monuments and flags. The reverse side of the Great Seal of the United States is never used in the same way as the front seal. The reverse has never been cut (as a seal) but is seen everyday on the back of the one-dollar bill. The story of the development of the Great Seal of the United States makes fascinating reading - it is one small, but incredibly important element that became part of the making of a new nation - America. The images on the Great Seal of the United States are full of symbolism and meaning. The men who designed the Great Seal of the United States were educated in Roman and Greek classical mythology and were knowledgeable of art history and symbolism of heraldry. The history of many of the symbols date back hundreds of years to the European medieval era and the rules of heraldry on Coats of Arms. These old crests and coats of Arms bore mottos in the classical language of Latin, which is where we start the story of the mottos on the Great Seal of the United States of America. 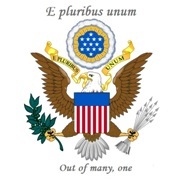 The national motto of the United States of America is "E pluribus unum" a phrase in Latin which means 'Out of many, one'. The words of the motto on the front of the seal are displayed on the yellow banner that the great eagle holds in its beak. This is an excellent motto for America as it succinctly reflects the ideals of a country which began with the 13 original states and then, over a relatively short period of time, extended into a nation of 50 states. This motto signifies the beginning of the new American era in 1776. Benjamin Franklin, Thomas Jefferson, and John Adams should form a committee to create a Great Seal for the United States of America. Fact 3: A Great Seal of the United States of America would ensure that important documents of state would contain an imprint of a seal that assured to their authenticity. Fact 7: Congress could not agree on the first design and it would take a total of six years, three committees and the combined efforts of fourteen men before the final design of Great Seal of the United States of America was approved on June 20, 1782. Fact 15: It had taken 6 years to create the Great Seal of the United States of America. The design of the Great Seal of the United States of America was a combination of elements provided by the members of all three committees and the ideas of Charles Thomson and William Barton. The final design of the Great Seal of the United States of America was influenced by the historian Benson John Lossing. Benson Lossing wrote an article on the Great Seal in the July 1856 Harper's New Monthly Magazine. His research, with copies of the original drawings by Francis Hopkinson and William Barton and an apparently original version of the reverse, led to his own interpretations of the first committee's designs. 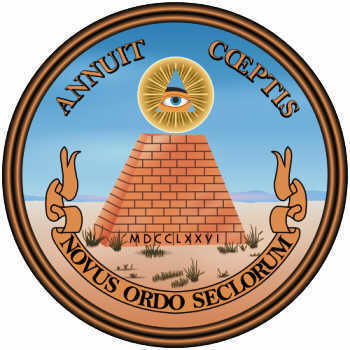 His depiction of the reverse of the seal more resembled the Egyptian pyramids and the Eye of Providence was changed to a left eye. The official versions of the Great Seal of the United States from the Department of State are largely unchanged from the 1885 designs prompted by Benson Lossing. The current rendering of the reverse of the Great Seal of the United States was made by Teagle & Little of Norfolk, Virginia, in 1972. It is nearly identical to the previous versions, which in turn were based on the 1856 version by Benson Lossing. The metallic die of the obverse (front) side of the Great Seal of the United States of America is what actually embosses the design onto important state documents. These metallic dies eventually wear down, requiring replacements to be made. and Blue, the color of the Chief (the broad band above the stripes) signifies vigilance, perseverance & justice." The physical seal is kept by the United States Secretary of State. As a coat of arms, the design of the seal has official colors, which also hold symbolic meanings. The physical Great Seal itself, as affixed to paper, is monochrome. The Seal of the President of the United States is directly based on the Great Seal of the United States of America and its elements are used in numerous government agency and state seals. Fact 19: The golden Circle of Glory, surrounding 13 stars, represents the ring of light placed around sacred subjects. Fact 20: Within the Circle of Glory there are thirteen 5 pointed stars that are colored Silver or White (Argent). In heraldry the star symbolizes honour, achievement and hope. Fact 23: The picture of the American Bald eagle dominates the center of the Great Seal of the United States. In heraldry the eagle was a symbol held by men of action and ingenuity, occupied with high and weighty affairs. Fact 24: The choice of the eagle was intended to at once recall the Roman Republic and be uniquely American (the Bald Eagle being indigenous to North America). Fact 26: A banner is held in the beak of the eagle containing the motto "E pluribus unum" meaning "Out of Many, one"
Fact 27: The motto is a clear reference to the integration of the original 13 independent colonies into one united country. Fact 29: The Olive branch and arrows grasped in the talons symbolize the power of peace & war which is exclusively vested in Congress. 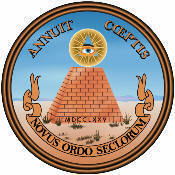 Fact 34: The motto "Annuit Coeptis" meaning (He [God] has favored our undertakings) is displayed at the top of the seal. Fact 36: For the final design of the reverse side of the Great Seal of the United States, Charles Thomson specified "A Pyramid unfinished"
Fact 39: Charles Thomson gave only a brief explanation of the symbolism of the pyramid, saying that "The pyramid signifies strength and duration"
Fact 40: The designers of the Great Seal did not call the eye an "all-seeing eye" or the "eye of Horus." They referred to it as the "Eye of Providence." However the picture of the pyramid does conjure images strongly associated with the Ancient Egyptians - see below. The connection between the images on the Reverse of the Great Seal of the United States and the Ancient Egyptians is so strong that it should not be ignored. There is no written evidence clarifying the thoughts of the designers of the seal. We can only comment on the beliefs of the Ancient Egyptians. To the Ancient Egyptians the positioning of a pyramid symbolized the passage from darkness to light and from ignorance to knowledge. The east-west axis, parallel to the daily journey of the sun, symbolized the perpetual cycle of rebirth and death. The eye symbol was used extensively as talismans to ensure that the eye itself would watch over and guard its wearer. There was considerable interest in the Ancient Egyptians during the period leading up to the American Revolution. Sacred texts, believed to be Egyptian in origin, had survived in eastern Byzantine libraries. These texts were referred to as the "Emerald Tablets of Thoth" or the "Secret of Hermes" were believed to reveal the secret of life providing the key to the ideas of the earth, fire, the sun and the moon and the hidden secrets of the ancients. Writings on the tablets were published by many famous people including Roger Bacon, Albertus Magnus and Sir Isaac Newton (1642 – 1727). Scholars of the age were interested in such ideas and perhaps these influenced the designers and creators of the Great Seal of the United States of America.